Accueil Produits Bande originale La bande originale de “La famille Tenenbaum”. Sortie : 18 décembre 2001. Film : La famille Tenenbaum. 111 Arthur Avenue – 0:38. These Days (par Nico) – 3:32. String Quartet in F Major (Second Movement) (par Ysaye Quartet) – 1:49. Me And Julio Down By The Schoolyard (par Paul Simon) – 2:43. Sonata for Cello and Piano in F Minor (par The Mutato Muzika Orchestra) – 7:18. Wigwam (par Bob Dylan) – 3:08. Look At That Old Grizzly Bear – 0:23. Look at Me (par John Lennon) – 2:51. Lullaby (par Emitt Rhodes) – 1:07. Police and Thieves (par The Clash) – 6:00. Scrapping and Yelling – 1:41. Judy Is A Punk (par Ramones) – 1:31. Needle In The Hay (par Elliott Smith) – 4:18. Fly (par Nick Drake) – 2:58. 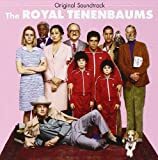 I Always Wanted To Be A Tenenbaum – 0:48. Christmas Time Is Here (par Vince Guaraldi Trio) – 2:44. Stephanie Says (par Velvet Underground) – 2:50. Rachel Evans Tenenbaum (1965-2000) – 1:17. The Fairest Of The Seasons (par Nico) – 4:08. Hey Jude (par The Mutado Muzika Orchestra) – 5:27.